In Alexandra Township, the work of media trainees is valuable, but not bankable. As part of the Ideas Will Travel project, I was allowed to spend some days with Siyakhona Africa in Alexandra, Johannesburg. 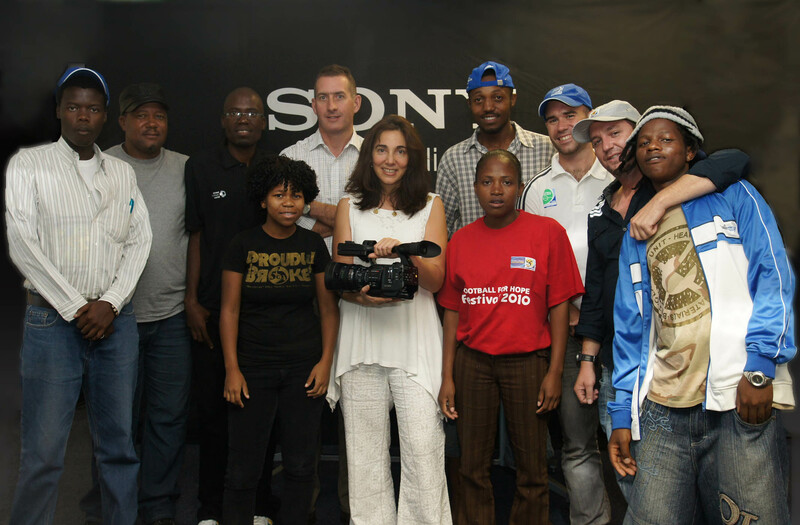 Siyakhona is a joint CSR project by FIFA, Sony, and streetfootballworld to create communal education and providing media training to young South Africans from poor neighborhoods. The Worldcup provided a perfect kickoff opportunity for the project. It offered the double support of equipment and funding from the sponsors, as well as four weeks of global interest in all things South African. When FIFA and streetfootballworld started their parallel grassroots soccer tournament in the Johannesburg township of Alexandra, during the last week of the Worldcup, the Siyakhona trainees were ready to go to work. During that time, the team not only published stories on their blog at http://siyakhonaafrica.wordpress.com, and spread the news on Twitter. Much more importantly, the project was featured in major media hubs, including CNN. Valuable media coverage, that should help make it a worthwhile marketing investment for Sony, who provided cameras and editing equipement for the media center. However, having overcome many obstacles to get to the program in the first place, the young trainees are already facing a new challenge: to give Siyakhona more independence from FIFA/Sony’s sponsorship. But neither the size of their audience nor its average income makes Siyakhona an ideal vehicle to create profit from advertising. It is thus no accident, that the blogpost on the final day of the tournament not only looks back and thanks all those who made Siyakhona possible. The team also reaches out to those who might be interested in supporting the program in the future. Personally, I really hope that they find support: The work they started seems very much in need in their community. Just look at one of the stories they have been covering besides the Worldcup: the rat infestation problem that’s plaguing Alexandra. Partly due to lack of sufficient municipal waste managment. But also partly due to the residents’ carelessness regarding trash. We (meaning all of us here “up” north) tend to see mass media mainly as vehicles for advertising. But leave our over saturated mass media space, and you realize how important they can be in upholding – or creating – a sense of community and communal action. So, dear readers, if you have an idea on how Siyakhona can open some now paths of securing funding, let me know at ideaswilltravel@gmail.com. I’ll gladly collect your ideas and will pass them on. Or contact Dannie Lurie directly via the Siyakhona blog.